The generosity of Tillamook County and the “take-care-of-our-own” resiliency of the community continues to astound our local Coast Guard families. The Port of Garibaldi has set up a receiving area for donations and a place to distribute the supplies to the Coast Guard and furloughed federal workers at the Port of Garibaldi shop, located at the corner of American Ave and 6th Street. Volunteers will be at this location today, Sunday January 20th from 10 am to 2 pm and on Monday, January 21st from 10 am to 2 pm to receive donations and to distribute the goods to Coast Guard and federal workers’ families. “We have set up a location at the Port for Coast Guard families to pick up donated supplies,” explained Port manager Mike Saindon. “These people are ‘helpers’ so, as you can imagine they are pretty embarrassed to reach out for help. Having retired coasties getting them the supplies is making it a little less stressful,” He continued, “So if anyone wants to get donated items to families we can facilitate that.” To donate items, please bring them to the Port of Garibaldi shop during the above times. Several Coast Guard families have young babies, so the need for diapers and baby formula has been mentioned, and as requests are made, they will be passed on to the community. There have been various random acts of kindness reported to the Pioneer – from a dozen pizzas being boxed up at Barview Jetty Store being sent to the Coast Guard; to the offers of reduced meals at local restaurants, such as the Hook, Line & Sinker in Garibaldi; Seashells & Sugar’s offer to provide birthday cakes or celebration treats; and the sizable donation from Fred Meyer that helped to stock this supplemental food pantry at the Port –Tillamook County is showing it’s true community spirit to help these “helpers” any way possible. Donations can be dropped off at the Port of Garibaldi office during regular business hours as well. 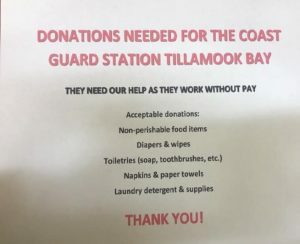 Sheldon Oil Co. is collecting donations at their Nehalem and Garibaldi Shell stations for the Coast Guard station Tillamook Bay as well. Donations can be made through CARE Inc. – www.careinc.org – designate for the Coast Guard/furloughed federal workers, or donations can also be sent to: Lower Columbia River Chief Petty Officers Assoc., PO BOX 34, Warrenton, OR 97146, and be sure to put to the attention of Tillamook Bay CG. 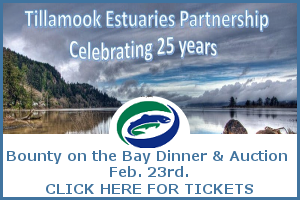 For more information about how you can help, please contact Port of Garibaldi manager Mike Saindon at 503-322-3292.